In this video we will discuss the difference between where and having clauses in SQL Server. Let us understand the difference with an example. For the examples in this video we will use the following Sales table. If we use WHERE clause instead of HAVING clause, we will get a syntax error. This is because the WHERE clause doesn’t work with aggregate functions like sum, min, max, avg, etc. So in short, the difference is WHERE clause cannot be used with aggregates where as HAVING can. However, there are other differences as well that we need to keep in mind when using WHERE and HAVING clauses. WHERE clause filters rows before aggregate calculations are performed where as HAVING clause filters rows after aggregate calculations are performed. Let us understand this with an example. Calculate Total sales of iPhone and Speakers using WHERE clause : In this example the WHERE clause retrieves only iPhone and Speaker products and then performs the sum. 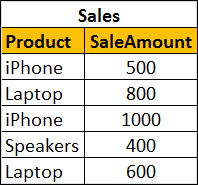 Calculate Total sales of iPhone and Speakers using HAVING clause : This example retrieves all rows from Sales table, performs the sum and then removes all products except iPhone and Speakers. So from a performance standpoint, HAVING is slower than WHERE and should be avoided when possible. Another difference is WHERE comes before GROUP BY and HAVING comes after GROUP BY. 1. WHERE clause cannot be used with aggregates where as HAVING can. This means WHERE clause is used for filtering individual rows where as HAVING clause is used to filter groups. 2. WHERE comes before GROUP BY. This means WHERE clause filters rows before aggregate calculations are performed. HAVING comes after GROUP BY. This means HAVING clause filters rows after aggregate calculations are performed. So from a performance standpoint, HAVING is slower than WHERE and should be avoided when possible. 3. WHERE and HAVING can be used together in a SELECT query. In this case WHERE clause is applied first to filter individual rows. The rows are then grouped and aggregate calculations are performed, and then the HAVING clause filters the groups. i am a student and learning sql. i am looking for such tutorials. i am an understudy and learning sql. i am searching for such instructional exercises.